One of our bestsellers the cute snake is back in stock. Only 11 days left of our Christmas sale. The changing of the seasons is a magical time. A time of anticipation. A time of slowly building excitement. We feel the warmth return to the breeze. We notice the garden slowly awakening from the cold. And we welcome the change we see, with stirrings for change within. Each one doing their best. This is a guest post by the lovely Kelly from Happy Whimsical Hearts. Our new puzzle has been tested by our "wooden toy inspectors" and all we can say is: We love making toys! and ever better is to see the little inspectors smiles :) The new puzzle crocodile is now available on our website. We spotted a Koala in a gumtree today! Our toys are lovingly handmade using 100% Australian sustainable, non-toxic and eco-friendly materials. peaceful thought, lost as only artists can be, quieting his mind, awakening his creative spirit. anticipation of the small hands that will soon clasp them and bring them to life. to the hook by the door. As he reaches for the light switch, his gaze pauses on the walls. many years before, a reminder of humble beginnings and a dream not yet realised. We are Little Joey Toy Co. We are toymakers. We are Australia ! Winter in Australia is a time of retreat; a time where play happens more indoors than out and children bring their imaginations to the surface through play with toys and the materials of the home. Fire places crackle, the house fills with the aroma of baking and children make mess and memories; until the return of Spring when the door is opened wide for them to race through back into Mother Nature. Our puzzle kangaroo is a great toy that encourages not only creative play but supports fine motor skill development and concentration. 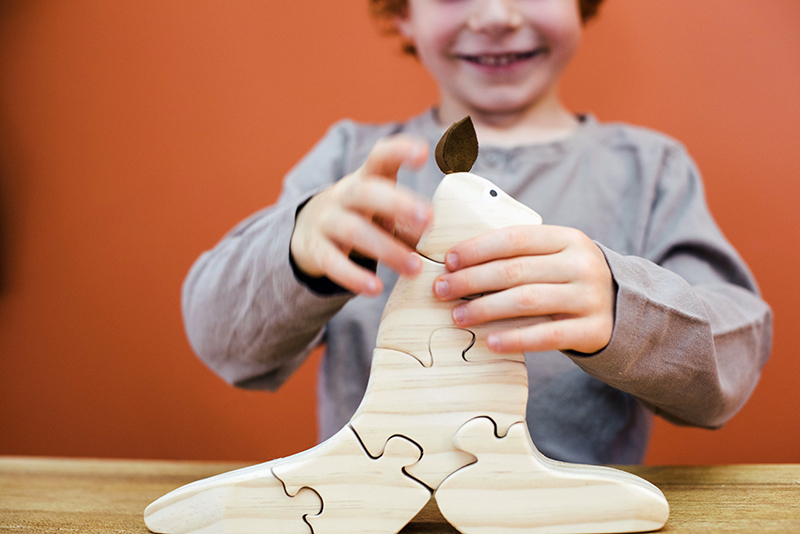 Like all our toys the puzzle is handmade in Canberra Australia using 100% sustainable Australian wood. CHECK OUT OUR INSTAGRAM GIVEAWAY ! Wishing you a lazy Sunday morning! Little Joey Toy Co. Proudly Australian made. Use the code "FREESHIP" this weekend and enjoy ! Proudly made by hand in Canberra Australia. Good news if you live in or are visiting Melbourne! The National Gallery of Victoria Design Store now stocks Little Joey Toy Co. They have our toys at both St. Kilda Road store and Federation Square. It's a beautiful warm summer day in Australia. We hope that the weekend was a fun one, filled with laughter and play. Our new catalogue is ready and can be viewed HERE. Our toys are individually handmade from scratch and here at Little Joey Toy Co., we care a lot about our planet and the future of our children. When you buy one of our toys you are supporting several Australian family owned businesses.The high quality materials that go into the production of our toys are 100% locally sourced. We believe that the bitterness of poor quality toys remain long after the sweetness of low price is forgotten.